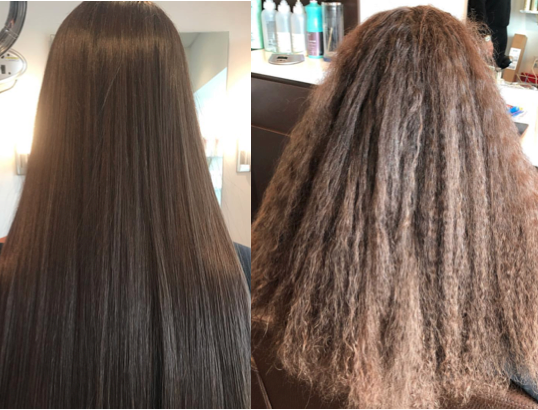 When I first heard about hair straightening treatments that could allegedly transform my unruly curls into silky smooth locks, I had to learn more. It sounded too good to be true, but I saw that it was possible when my peers started doing the treatment and the results were striking: their hair was frizz free and straight. I went home to my mom and immediately informed her of my discovery, bombarding her with names of treatments that my friends mentioned: Brazilian Blowout, Keratin, Puraluxe, Matrix, Trissola, and so on. What I did not know is that this type of hair straightening treatment has been around for a long time. In fact, many women get these treatments as frequently as every four months to keep their hair manageable and desirable. In my mind, nothing could go wrong. After all, millions of women get treatments each year. My mother, on the other hand, was skeptical. She did her own research on the treatments, consulting with friends on their experiences and received a lot of mixed feedback. Mostly everyone reported that their hair was softer and/or straighter, but a good amount noticed their hair also thinned, or they experience dry/oily scalps. With more research, I found that a lot of marketing from these companies can be deceiving. For instance, the cult favorite Keratin Hair Treatment is actually somewhat of a misnomer. The Keratin protein which they advertise as a protective layer that adds shine is not the main ingredient that makes the hair straighter. The ingredients that are responsible for breaking the bonds of the hair and making it straight are sodium hydroxide and formaldehyde, a chemical that has often been linked to cancer. The fact is, even if companies call their product “chemical-free,” all effective straightening treatments must have formaldehyde to a certain degree, or else the hair bonds would not become straight. After an in depth investigation, my mother objected to the idea of a treatment, and I could not really blame her, I was worried my hair would thin out or I would inhale too much formaldehyde. Two years past, I was still struggling to manage my hair, while more and more people around me were getting fabulous results from their hair treatments. I started to feel that I had over complicated the potential dangers of the entire procedure, and so did my mother, so we decided to try perhaps the most reputable brand, The Brazilian Blowout. I sat in a salon chair with a mask around my face for three hours, as the stylist applied the product into my hair, flat ironing it multiple times to seal in the formula. My scalp began to burn and my eyes began to water from the chemicals. Immediately afterwards, my hair was almost perfectly straight and silky smooth. I felt more confident and I did not have to put so much effort in styling. After each wash, my hair became slightly curlier, but for the most part, I enjoyed my lustrous strands that did not frizz under any circumstance. Good hair days were an everyday occurrence for about two months, until I noticed it beginning to wear off. Suddenly, my curls came back wilder than before. Since that treatment, I have not done another one, although I did love the results while they lasted. I just felt that since it did not last long and I noticed a change in my natural curl, doing a treatment every two months could potentially damage my hair in the long run. If the treatment had lasted a couple months longer, I think I would definitely be more open to it, but from my experience, I learned that I should not rely on happiness provided by a semi-permanent hair treatment. Today, hair smoothing treatments have become a huge phenomenon, as many different versions of this procedure are popping up to attract the millions of girls and women who want more manageable hair. Some products and stylists swear their formula is organic and formaldehyde free, which is definitely questionable. Contrary, there are also many hair stylists who admit that without the formaldehyde there is no potency to the treatment, but by wearing a mask and doing the treatment outside, it can be less harmful. At the end of the day, the dilemma of whether to do a treatment or not is a personal choice. There are thousands of articles and opinions that all claim different things, so it can be difficult to make a decision, but one should definitely consider the advantages and disadvantages for their hair type before making a decision.